We’ve been eating too much meat and not enough vegetables so last weekend, we cooked us up a preview of things to come in our garden. We can’t wait for summer! In the meantime, we had to content ourselves with market bought veggies. This is a quick and easy vegetable medley that can be a meal in itself. Vegetables (Green Beans, Yard Long Beans, Mushrooms, Zucchini, Eggplants and Butter Squash) – you can use any combination of vegetables you like. The kind of vegetable we use all depends on what’s available at the market. Heat about two tablespoons of oil and stir fry the pork pieces until slightly browned. Add garlic and onions and cook for about two minutes until fragrant. Add the tomatoes and cook an additional five minutes until they have cooked down. Add the oyster sauce and 1/4 cup of water and start layering the vegetables in the pot according to which cooks the longest first. So here’s how I layered my vegetables: beans, mushrooms, squash, zucchini and eggplants. Cover and cook for 5 to 7 minutes until all the vegetables are just done but still has some body. Adjust the seasoning with salt and pepper, stir through, and serve. I love veggies. I just made some today. This one you made is just as easy to cook. Oh, I love veggies. I just made some today. This one you made sounds easy to make. Hi Charla, we love our veggies too 🙂 On our way to the farmer’s market now to get a fresh supply. That looks so delicious. I love fresh vegetables! hi PinaySexy, thanks for dropping by. 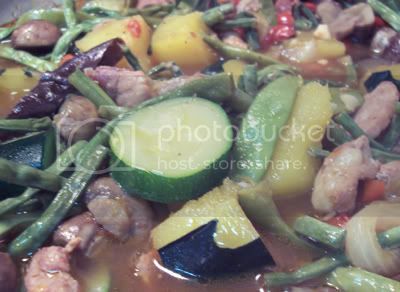 Yes, it’s a variation on our pinakbet. The only difference is no bagoong and no ginger 🙂 still tastes fantastic though.